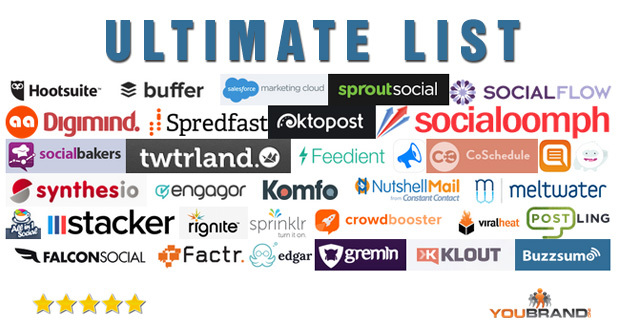 Ultimate List of All in One Social Media Tools – You Brand, Inc. Managing all your social accounts can be a task. A few years ago an all in one social engagement tool would have been hard to recommend. Now that major social platforms have matured a bit these “all in one” social management tools are closer to being possible. Here’s how we defined this list. All of these tools allow you to at least manage more than 3 social networks, most of them allow you to engage or manage in Twitter, Facebook, LinkedIn, and Google+. The more robust ones add in Instagram, Pinterest, Weebo, and other similar networks. In putting together this list (and using many of these tools ourselves) here’s our quick take on finding the holy grail (all-in-one tool) of social engagement. If you’re an enterprise level user it’s getting pretty close to an all in one platform, there’s many options on this list. In the mid-range (90-under 500 a month) you’ll find platforms that do well but lack connections and a full picture view that any serious social marketer will crave. Below that range you’ll find that you’ll be using a series of tools, some that perform and integrate with certain social networks better than others. You’re biggest challenge on this level is creating a unified view of all of your activity and connecting the dots with the other aspects of your marketing. We also included a few tools in here that are mobile only (which is a new and emerging space). As usual with all of our ultimate lists, we’ll keep this updated as we find new tools and platforms. Hootsuite provides you with a social media dashboard to manage and measure your social networks. You can manage multiple social networks, schedule tweets and messages, track brand mentions, and analyze social media traffic. For engagement you can schedule and manage your social outreach and engage with people across all your accounts on one dashboard. Another good feature about Hootsuite is it's collaboration features. You can assign messages, create workflows, and streamline communications with collaborators and clients. The interface can be customized and is quick and easy to use. Hootsuite also has a range of tools or 3rd party addons that work right inside your dashboard. For instance, you can connect tools like ZenDesk, Pocket, or Flipboard. Buffer helps you manage multiple social media accounts at once. Quickly schedule content from anywhere on the web, collaborate with team members, and analyze rich statistics on how your posts perform. Share easily to all your twitter profiles, facebook pages, facebook profiles and linkedin accounts. If you're not familiar with buffer you should be. It is a powerful social scheduling platform. It also provides you with suggested content to share, analytics and advanced scheduling features. On the fremium level you can connect multiple accounts. The Awesome plan allows you to connect an RSS feed to Buffer, have a 100 scheduled posts (released at prime times) and 10 social profiles. We use Buffer each and everyday to share content. As one of the industry's social pioneers, Radian6 from the ExactTarget Marketing Cloud allows you to quickly and efficiently track, monitor, and react to comments, questions, and complaints as they happen. And with the most robust social offering, you can tap into over 650 million sources from Twitter, Facebook, YouTube, blogs, news, and more to hear what’s being said about your brand. Then, take action by routing important social media posts to any user across your organization for insight or follow-up. Understand the social posts that matter most by enhancing those conversations with meaningful insights—on everything from sentiment, demographics, trends, intent, and more. That functionality is integrated with 15 social analytics providers in one out-of-the-box solution. Think of it like the world’s only app store for social media analytics. Radian6 strives to help you drive revenue by understanding what content drives traffic, finding the conversations that will convert, and using them to grow your pipeline. You can discover purchase signals and point-of-need conversations or even intercept discussions with competitors. Plus, it has integration capabilities linking you to Salesforce CRM, Service Cloud, web analytics, and more. You can also add another arm to your customer service department with social listening. This platform is one of the most robust you will find and it is an enterprise level platform. SproutSocial allows you to create an exceptional brand experience across just about all major social networks. Built with a collaborative environment that ensures smarter, faster and more efficient social communications. For engagement, you can quickly engage with your audience and route issues to internal teams, personal, or systems allowing you to reach your audience across networks and promptly reply to your customers. Essentially, Sprout makes it easy for teams to keep tabs on conversations and effectively engage at all times. For publishing, you can publish your messages to Twitter, Google+, Facebook and LinkedIn. All this is tracked with integrated and centralized analytics & reporting. Sprout tries to provide you with a holistic view of your social media performance with a family of core reports. The specific reports for Twitter and Facebook do a good job of measuring engagement and user performance. Another good feature is the unified inbox for all of your social channels in a single Smart Inbox. You can also focus or filter this based on specific channels. Sprout is one of the best all in one social engagement platforms you can find. SocialFlow is an entreprise level solution geared towards large brands, agencies, and major publishers. For marketers (especially brand marketers), SocialFlow looks to solve complex social media problems every day, primarily how to handle all the noise and find the gems. For publishers, SocialFlow handles social publishing for the largest, most demanding, and most influential publishers in the world. Finally, for agencies, whether you manage content creation, organic media, or ad budgets, SociaFlow’s data-driven solutions can support and drive superior results for your campaigns. If you’re looking for a strong contender for an all in one social engagement tool check this out. Traackr is primarily a relationship and influencer management platform. The platform provides you with everything you need to discover your influencers, manage key relationships, and measure their impact on your business. One thing this platform really strives for is giving you a full 360 view of the influencers or your target market (which really means they find all the ways you can possibly reach an influencer). From there you can gain insights on your influencers and plan initiatives that will let you develop focused and value-add relationships with your influencers. A big bonus is the ability to use metrics to prioritize outreach, measure the impact of your engagement and report on the results of your efforts. The Digimind platform allows you to listen, engage, analyse, and report not just from social media but from around the web. You can monitor unlimited social media and web sources and sort mentions by reach. There's also sentiment analysis and smart content grouping. What that means is instead of seeing the same story about the same thing this platform will group related stories and topics. That make the job of sifting and sorting for engagement that much easier. Digimind Social’s artificial intelligence engine calculates an influence score for every tweet, blog post, article,video, etc., based on criteria like number of followers, mentions, visitors, and reach. You can analyze and benchmark your campaigns to see which are bringing the most ROI. The benchmarking and analytics allows you quickly compare your campaigns, brands, people,or competitors. You can see how anything compares by reach, sentiment, influence, or any user-generated tag you’d like. On the reporting side you can generate reports in a variety of pre-designed templates or in your own customized version. Creating insightful daily, weekly, monthly or annual reports. Digimind is a great all in one solution for not only social media engagement but includes many features to understand your total digital footprint. The Spredfast Social Marketing Platform empowers brands to involve their audiences with relevant, engaging experiences to build meaningful relationships. It has tools to engage fans and customers with relevant, timely content across social channels. Using what are called conversations your team is in control to plan integrated campaigns, orchestrate real-time engagement, execute targeted advertising, and track the impact of social across your business. They also claim to be able to provide you with unique social “wow” experiences published on any screen – from your website and mobile devices to digital billboards and live TV. Using the Spredfast Experiences you can curate and filter relevant social content in real-time, visualize it and then publish across virtually any digital asset. This is backed up with thier Spark platform that helps you discover relevant trending topics and enables content creation. Spreadfast is definitely an enterprise level tool. Simplify B2B Social Media Management. As a B2B company, your content needs to be where your clients are. Oktopost lets you easily manage large-scale content distribution to social media, across all of your profiles, groups and company pages. OKToPost positions itself as a B2B social provider. You can quickly create and manage social campaigns to promote any type of content. Schedule your content distribution in advance for any day or time to multiple LinkedIn, Facebook, Google+ and Twitter social profiles, from one single platform. Manage all of your social marketing, and measure the results for each campaign. View clicks, conversions and engagement for every post, message and group. Leverage seamless integrations with third-party platforms such as Salesforce.com and Marketo, and automatically sync valuable analytical and lead data. How is Oktopost Different than Hootsuite and Other Platforms? We love Hootsuite, but the needs of B2B marketers are different. While other platforms focus on engagement and brand awareness, Oktopost helps you manage content and measure the true business value of your social media marketing. SocialOomph provides a free and paid productivity enhancements for social media. Just about every network is covered from Facebook, Twitter, LinkedIn, Plurk and your own blog or site. There are a ton of useful Twitter features like scheduling tweets, tracking keywords, viewing mentions and retweets, direct message (DM) inbox cleanup, auto-follow and auto-DM features for brand new followers. Social Oomph will also allow you to auto-reciprocate follows which is one of its most handy features. The only drawback to the platform is the interface, there’s so much going on that to get the most out of it you have to spend some time really learning the system. Socialbakers is a user friendly social media analytics platform which provides a leading global solution that allows brands to measure, compare, and contrast the success of their social media campaigns with competitive intelligence. You can easily manage Facebook, Twitter, YouTube, and Google+ social profiles and pages. Their Builder is a content management platform that helps marketers increase social media efficiency. With Builder’s real-time competitive analysis, performance reporting, and collaborative workflow, you will maintain total control of social publishing. Spend less time on administrative tasks, and have more time for creating engaging content. Listening lets you monitor conversations across Facebook and Twitter in real-time and performs detailed, exportable analyses of conversations by keywords and across multiple social media platforms. Find out how you are performing in the social ad space compared to your competitors. Less money, less time & manage more ads in seconds. Ad Analytics is the perfect choice for agencies and departments dedicated to social advertising. Despite the obvious Twitter like name Twtrland seeks to be a social media resume of sorts. It allows you to see a visual snapshot of your online presence on Twitter, Facebook and Instagram. But it goes well beyond that, you can also use it Twtrland to discover influence metrics, audience demographics, close network and much more. Going with the PRO plan allows you to get advanced insights on how your brand can improve on Twitter, Facebook and Instagram. Beat your competitors and Track your landscape, see what's working for them and develop your strategy from that insight. Finally you can use this platform to create relationships with the top influencers in your sector and build your community. Feedient connects seamlessly with Twitter, Facebook, Instagram, Tumblr and your YouTube subscriptions. No need to refresh or click on an update button – they will automatically send you the new posts as they arrive. The universal notification center gathers all the notifications for your accounts in one single place. If you're looking for a social inbox check out this tool that's still in beta. Everypost is mobile (iOS & Android) social media publishing tool used by content professionals and social marketers. With Everypost you can manage and post and personalize content to Facebook, Twitter, Google+, Linkedin, tumblr, and many others social networks. One of the great things about this platform is It doesn’t matter the format of the media, pictures, videos, or the length of the text, Everypost makes it possible to post and publish in a very easy way. CoSchedule leads by saying it's a content marketing editorial calender for WordPress. While that's true it's also much more than that. It's a visual social media publishing platform that works right within your WordPress dashboard. You can easily publish and schedule for Twitter, Tumblr, Facebook, Google+, LinkedIn, and they connect to Buffer for more functionality. There's one feature that allows you to schedule social media updates for future scheduled posts is what really makes coSchedule a great platform. You're one social person. Get one social app! Fuse brings together all your favorite social networks in one unified experience. A single feed of updates from your Facebook, Twitter, Instagram, LinkedIn (and more to come) friends allows you to see what the people you follow across all networks are up to. Your personal interactions, messages, and search are there as well. You can quickly turn each network on or off in the app depending on your preference for the moment. This gives a unified fFeed views, that's right no more one network per tab. All your networks are in one place. In addition to the "all in one" inbox you also can share using this app. Facebook and Twitter support are free with the app. LinkedIn and Instagram are a one-time in-app purchase to unlock. Snowball shows messages from all your favorite social apps in ONE place (exclusively for Android). Snowball is *not* another messaging app! It organizes your messages from the apps you already love providing you with a single, easy-to-access place to view everything. Snowball supports: Facebook Messenger, WhatsApp, Snapchat, SMS, Hangouts, Twitter, Line, WeChat, and Slack with Telegram, Viber, and Skype and coming next. With Syntesio brands can listen, analyze and engage in real time, within one platform, around the world in over 50 languages across 200 countries. Get complete coverage of both social and mainstream media worldwide, with our large-scale data aggregation system designed to collect, store, and index massive amounts of content across the entire web in real-time. You can easily track and analyze all conversations and sentiment around your company and industry across social media channels, and deal with crises in real-time. Expand your social reach and build connections with the right people and companies for your brand advocacy programs. With SynthesioRank you can identify top influencers and generate targeted awareness around your brand and track and measure your online reputation, collaborate and engage in real-time, and manage consumer relationships in social media in one single, easy-to-use platform. Social Media Marketing starts with tracking down the conversations relevant to you. With the Engagor Social Media Inbox, you have everything you need to listen and respond to messages from Twitter, Facebook, news sites, blogs, review sites, wikis, Q&A sites, forums, Google+, LinkedIn, Foursquare, Instagram, Pinterest, etc. The Engagor Dashboard gives you a quick overview of new social mentions, news articles, forum and blog posts, as well as new tasks assigned to you by coworkers. You can monitor, analyze and respond to all mentions from one single tool. Manage all messages by archiving or tagging them, to ensure easier searching, filtering and reporting. The built-in Social CRM, you always have all the information you need to offer excellent customer service. Monitoring alone is not enough. Long lists of messages about your brand are often meaningless, charts are not. Engagor pours all the information into meaningful charts, all customizable and exportable. Engagor is centered around teamwork: assign mentions to each other, set up user roles and log all team activity. There is also a built-in Social CRM system that collects all information you have on social profiles. On top, all on-going team activity in Engagor is displayed real-time. Automatically assign mentions containing a specific word to a team member, set up email alerts, automate tagging and reporting by using our wizard. All these features allow you to streamline your online workflow. On top of that you can use this platform to understand the influence of an individual post, or take a step back and see larger trends. Track conversions, view demographics data and see summaries of your social media channels performance. The social media publisher allows you to create, schedule and route messages across Facebook, Twitter, YouTube, Google+ and Instagram from one easy-to-use interface. You can easily publish content to fans by language, country or more advanced targeted mechanisms. The social media monitor allows you to listen to the buzz about your brand in social media with our listening tools and receive Storm Alerts by SMS and e-mail if a user storm is brewing. This means you can respond timely to your community across multiple social networks and route messages internally in the organization. From there you can manage your Facebook Pages. Keep track of Likes, Posts, Comments, and Insights. You can also manage your personal Facebook profile too, with all your Facebook Birthdays, Photos, Friend Requests, Wall Posts, News Feed, Event & Group Invites, and Messages in one interactive email. For Twitter you can see your mentions, new followers, quitters, search results, and tweets from your favorite lists in your Twitter summary. Tweet, Reply, Retweet, and DM without leaving your inbox. For LinkedIn you can see profile updates and recommendations from your entire network and monitor all your discussion groups via a single, consolidated email. If you need to stay on track of reviews you also get rating & review monitoring so you can keep track of ratings, reviews, and check-ins from Yelp, CitySearch, & Foursquare. The Meltwater Buzz social media marketing suite combines deep social media monitoring and analytics with efficient social engagement. . The Meltwater Buzz social media marketing software suite enables a complete lifecycle approach to social community management that helps marketers cultivate vibrant social communities with intelligence and ease. You can use the Buzz Listen Social media monitoring module to understand social conversation volume, sentiment, and trends. MeltWater also has engagement tools and works well for a team environment. MarketWired Resonat is a communications platform to reach journalists, bloggers, and other professionals interested in your news or buzz. It taps into a global database of media so you can discover influencers and reach the right audiences. You can distribute to custom news lines and custom lists. You can also distribute your news items to Facebook, Twitter, LinkedIn, and even your companies newsrooms. Make more informed decisions about your content and campaigns, and more deeply understand and leverage the business impact of your communications. All in 1 Social is a social media management platform that allows you to manage Facebook, Twitter, Google+ in one dashboard. It has everything you would expect in a social management tool, from scheduling, content moderation, analytics, keyword tracking, and more. Allin1Social allows you to publish any type of content and will outline what content works best and the most appropriate time to publish it either through a manual or scheduled process. A nice Facebook feature is you can create Page Groups to analyse and compare several pages across different KPIs or perform a 2-Page comparison of any Facebook page defining different metrics. To get started you can sign up for a free account and to unlock more features step up to one of their paid accounts. Stacker aims to be a universal Inbox allowing you to read and respond to incoming messages across all your Social Media accounts from a single Universal Inbox. There are a few pretty good features built right in. First the auto scheduling allows you to add all your content into Stacker and it will be published at the best times throughout the day so that your fans & followers see your updates more often. Stacker really does make it easy to publish, reply & track performance across multiple social media accounts. You also get access to insightful easy-to-read reports on every message you send out to your fans including - Clicks received (w/ User Locations), Likes, Replies, Favorites, Retweets & more. If you’re looking for a an all in one social inbox check this out. While this platform does bill itself as a social media management tool it seems to focus more on campaigns and promotions. You can run end-to-end social media campaigns across multiple networks. Get campaign level reporting to know what’s working and monitor and engage from a single dashboard. As with most platforms you can schedule posts – individually, or as a series. It also has team and collaborative features all from one, easy-to-use interface. Sprinklr's social media management platform is purpose-built for enterprise deployment and integration. It makes social media a core function for every one of your business lines, including Sales, Marketing, Customer Service, PR, Events, and Crisis Management. This enterprise level tool has it all. Content planning and publishing, engagement and moderation, audience segmentation, paid and targeted amplification, and social analytics and reporting. Their social CRM feature allows you to share a unified view of your customers across hundreds of social channels. Preserve your hard-earned social data by integrating it with your legacy backend CRM and build unified 360 profile views of your customers over time. This enterprise level tool will not disappoint. Crowdbooster enables you to find your most engaged fans & followers and to quickly adapt to your audience. With their tech you gain audience insight, suggestions on who you should engage with, and how to improve your content. They promise real-time data that's always up-to-date, so you can quickly get your key performance metrics in customized dashboards. With this dashboard you can create editable, beautiful graphs & tables for you to view. Crowdbooster does have some unique features for both Facebook and Twitter. For instance, you can see the benefits of long-term engagement of a one-time social media campaign with flexibility to analyze what drives your community to grow. You will also get an alert when you have a spike in engagement or followers. It's features like these that make this a interesting tool to have your toolset. With Viralheat’s comprehensive tool you can monitor the conversations about your brand across Twitter, Facebook, Google+, LinkedIn, Instagram, Pinterest, Tumblr, URLs, and videos. With the ability to create Smart Streams to identify trends to drive insights around your social media performance. Viralheat's competitive monitoring and analysis features keep you ahead of your competition and understand competitors' performance on social media. You can also monitor conversations about your competitors and even track campaign performance. ViralHeat also includes reputation management, helping you keep up with every day consumers who are voicing their opinions about brands, products and services through social media. With the platform you can easily listen to what is being said so that you can react appropriately. Finally, Viralheat’s Human Intent technology automatically identifies leads based on user’s social media behavior, allowing you to reach out with the appropriate message at the right time. One very useful feature is sharing news every time your business or brand is mentioned on the web. With a few clicks you’ll be able to share that tweet or review with your other social channels. This tool is a good addition if you have a brick and mortar location or have conversations that expand well beyond typical social channels. For listening Falcon Social allows you to stay on top of multiple campaigns by assigning listening initiatives by project or topic. Within each project, team leaders can determine permission settings by department or location. Monitor brand mentions across multiple social streams and identify key influencers to help grow your digital presence. Access daily performance data to stay on top of social activity and KPI benchmarking. Explore social data that is similar in composition — keywords, time, or date — to existing listening projects. By clicking on incoming metrics, users can dive into search results to source ideas for content development. With engagement you can assign messages and comments to specific users or entire teams within your organization. These assignments can also be labeled and submitted to your CRM system for further review. View all your messages—from Facebook, Twitter, Google+, Instagram and Youtube—in one feed. Respond to comments and messages, or assign moderation tasks to your teammates. Craft responses to popular questions or inquiries, and provide a simple solution for onboarding new employees or establishing a consistent tone. Enable incoming messages to be indexed as important if they meet criteria based on engagement level, previously marked content, sentiment, or influencer score. Access quick moderation to delete or ban users based on previously deleted content, blacklisted words, or excessive formatting. For publishing develop an editorial process by mapping ideas, drafts and deadlines on the graphical calendar interface. Schedule posts to different social networks and filter settings to identify channels in need. Content Pool will improve your company’s social asset management and help teams, on a local or global scale, with content creation and distribution—and benefit from low-cost, shared resources. Generate a preview of your written draft, and see how it will look in the native environment of your choice. Eliminate test accounts by executing correctly the first time, every time. For reporting you can create unlimited reports to monitor business goals. Select metrics by channel, team performance, or benchmark to build a custom report, and demonstrate social ROI. Build a report by indicating a specific channel, metric and visualization; these options apply to popular social networks such as Facebook, Twitter, Google+, Instagram, and Youtube. Observe how paid, owned and earned content is performing, and make adjustments based on contextual indicators such as time of day, audience, messaging or ad spend. All of this makes Falcon Social a truly robust social media management platform. The enterprise level SocialPort™ is a social communication management system that includes many personalization and customization features desired for anybody looking for this level of platfrom. This platform allows organizations to quickly and easily share content on social platforms, enabling them to grow relationships and exhibit thought leadership in their industry. rFactr also provides social content training that prepares each individual in a business to engage in conversations and share posts that have been optimized for social channels. This platform makes it easy for individual users and leadership to monitor the impact of social content campaigns by offering access to in-depth insights and analytics. Comprehensive reports allow leadership to develop optimized social content strategies by tracking everything from content effectiveness to expressions of interest. SocialPort™ provides you with an all-inclusive content management system. Users can leverage SocialPort™ to write, schedule, and publish relevant content that will enable them to build rapport with their social networks. Management can also provide individuals on the platform with corporate-approved content optimized for their social audience. Edgar is a social media scheduling tool like no other. Instead of publishing your updates just once and throwing them away like yesterday’s rubbish, it catalogues them in a limitless library that you build over time. All of your updates are sorted into categories that you create and are published on a schedule that you choose, so Edgar publishes what you want, when you want it. No manual scheduling, no busywork, and no hassle. With Edgar in charge of the tedious busywork, you can finally break the never-ending cycle of writing and posting new updates, and spend more of your time on social interacting directly with your audience in real time. If your in a heavily regulated industry you've most likely already heard of Gremln. This platform has special features so you stay compliant in regulated industries, such as Financial Services and Healthcare. Gremln's social media management tools allow you to easily prevent posts with restricted keywords or phrases and archive your posts for up to 3 years. Gremln ensures compliant social media communication for companies that adhere to SEC, FFIEC, FINRA, and HIPAA regulations. As with most tools you have an all in one inbox dashboard for Twitter, Facebook, and LinkedIn. Here you can engage with customers, monitor your social mentions, and schedule your posts at the optimal time and frequency in each social network. All of this within the rubric of compliance. The features and engagement tools within Klout have grown recently. In it’s essence Klout aims to understand influence and influencers and provide a simple number (Klout score) that represents that level of influence. If you haven’t logged in recently you would have missed quite a few new features. First up, you can create and schedule social updates. Klout will also suggest content for you to share or read. There’s also built in measurement tools and a campaign interface. In addition, you might be able to take advantage of what are “perks” or special deals from companies and brands. Klout is a platform you should explore as it appears to be one of the core social platforms that will stick around.